Fresh air, sunlight, nature - the great outdoors can help children grow and develop physically, socially, and emotionally. But there are some dangers that can be very serious and even fatal. Drowning, accidents, dog bites, sunburns, frostbite - be sure you're aware of and minimize the dangers. Ensure that your child knows how to use the playground equipment safely. If your child needs help to get onto it, it is probably meant for older children. Bicycle Safety: Help Your Kids Have a Safe Summer Ride - Bike riding is a terrific activity for children and a great opportunity for families to be active together. It's fun, it gets us outdoors, and it builds strong, healthy bodies. Firearm Safety - Many Canadian youth are injured or killed by guns each year. Flood Stress Information - When floods threaten individuals, families and communities, it's normal to experience strong emotions. The stress of losing a home or treasured possessions can take a serious toll. Insect Repellents for Children - How to combat bug bites. 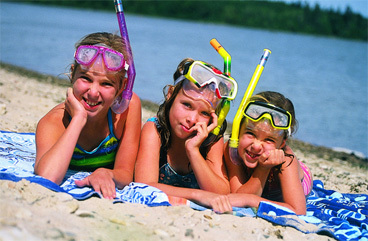 Sun Safety Guide - Sunburns and suntans are evidence of skin injury. Trampoline Safety - Using a trampoline is very risky for children and youth. They are not recommended for home use. Frostbite - Skin can freeze in cold wind, rain or snow. Find out what you can do to prevent it. Ice Safety - Tips on how to keep safe on and around ice. Snowmobile Safety - Children younger than 16 should not operate snowmobiles. Find out how to use them properly. Winter Safety - Tips to help parents and children enjoy winter activities safely. Winter Weather Safety - Extreme cold temperatures can threaten personal safety. Find out what steps to take to have a safe winter.